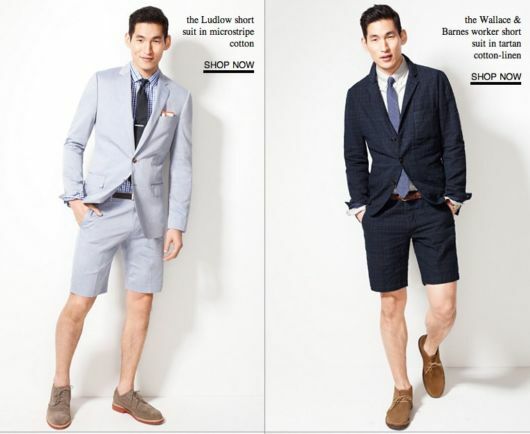 Retailers are starting to push a new trend in menswear: the short suit. The ensemble looks like a regular suit from the waist up, with a sport coat over a button-down shirt and sometimes a tie or bowtie. Instead of trousers, however, the suit’s bottoms are cropped at the knee. J. 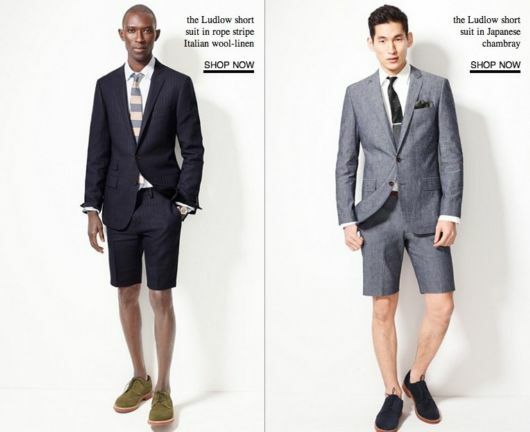 Crew, Topman, Asos, and Barneys are among the retailers selling the short suit this season. They may be taking cues from fashion icon Pharrell Williams, who donned tuxedo shorts to the Academy Awards earlier this year. "It’s definitely having a moment, particularly with younger guys," Jon Patrick, the creative director at menswear company J.Hilburn, told Businessweek. J. Crew is offering four different kinds of short suits that cost about $400. "We have wanted to make a suit short for a long time but knew it had to be just right for it to look good," reads the product description for one of the suits. "We would like to finally introduce you to the Ludlow short. It has an old-school country club vibe (more ‘Gatsby,’ less ‘Caddyshack’) and is almost guaranteed to win the battle for best-dressed at nearly every summer occasion." 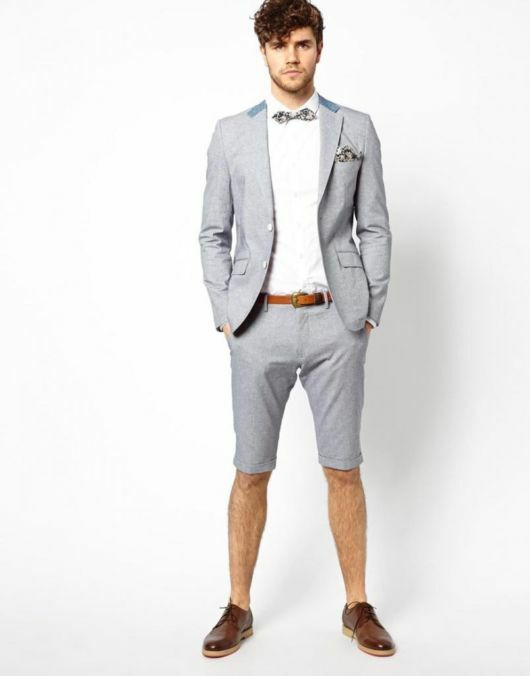 Topman’s short suit runs $390. "For a contemporary and stylish silhouette, our skinny fit suits offer a figure hugging and trend-led shape," reads the item’s description. The U.K.-based fashion brand Reiss sells a pair of khaki suit shorts for $130. "Ensure that even on warm days your style remains sharp," reads the retailer’s product description. Reiss recommends pairing the shorts with a plain black crew-neck T, suede driving shoes, and a pair of aviator glasses for a look that says "smart and informal." 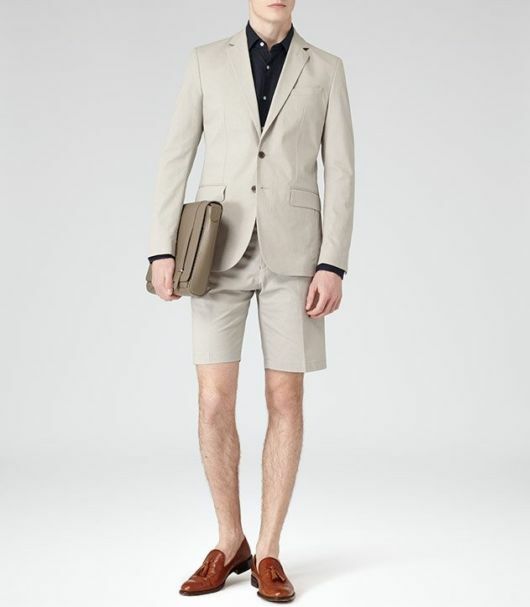 For a less traditional look, Barneys New York carries a $859 Comme des Garcons short suit trimmed with chiffon panels. We think it looks pretty bizarre. 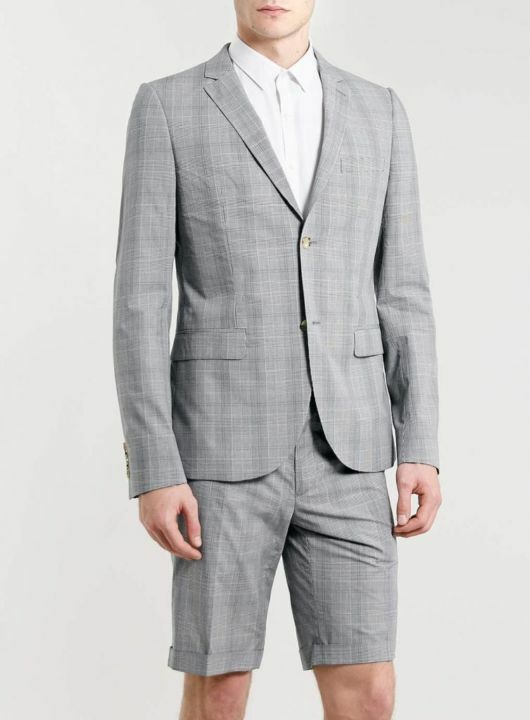 This short suit by Asos is definitely less bold, but it’s still pretty expensive at $409.